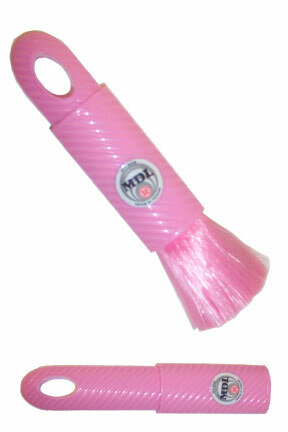 This mini size static duster features a retractable design for increased versatility and convenience. Slide back the hard plastic case to reveal the synthetic fibers. Slide it back in the opposite direction for storage. This static duster acts like a magnet for dust, and makes it super easy to clean. Thanks to it's compact size and unique design, it is perfect for travel, in your purse or desk, or to keep handy just about anywhere. Use it to clean your computer keyboard, the dashboard in your car, knick-knacks on shelves and so much more. The retractable design keeps the duster protected until you are ready to use it, so it will always be clean and ready. A static duster is a truly green way to dust your home office or vehicle. There are no sprays needed and absolutely no chemicals used. Static electricity pulls up dust and locks it into the synthetic fibers. Don't spend one more minute dusting with old rags and outdated dusters. Dust will appear to leap off of your furniture, blinds, computer keyboard, television, collectibles, plants and more. Virtually all dust clings to the mini duster instead of being pushed from one spot to another, or scattered into the air like cloths and rags do. After using this retractable duster, just shake it clean over a trash can or wash with mild soap and water. These retractable dusters literally pull dust and dirt from any surface and they do it without any risk of damage thanks to the gentle, synthetic fibers. Each strand will build a charge to attract dust like magic from any surface in your house or vehicle. This mini duster can be used anywhere in your home you want to dust. It's gentle action will never harm anything you use it on, so you never have to worry. Keep it next to your computer to keep your keyboard clean. Lift dust and dirt out of the keys with just one pass. Or you could use it to dust delicate knick-knacks or other small items without moving them. Keep it in your car to dust your dashboard on the fly. It is a handy tool to have around fo rquick clean up. Stop using dirty rags to dust. Order Your Mini Duster Today! Dimensions 2.25" x 2.25" x 6.5"
Retractable Mini Duster - Use in your home, office, car, recreational vehicle or almost anywhere else! Hundreds of thousands of fine nylon fibers. No More Dirty Rags To Do Your Dusting! Use Static Electricity to attract & hold dust like a magnet. Just what I need for my computer/desk! It's a great brush but too thick for my eagle. My eagle has big wings that spread out and separate and get duster between the wings. The wings are not spread out enough to use this mini duster but I use it for other things. I bought this item to use on delicate collectibles with small parts. It gets into small spaces and works well. Can I get 6 retractable mini static dusters all in Red? For specific color choices, use the comments box at checkout, or call to place your order by phone.